1945: Upon liberation of Nazi concentration camps by Allied forces, those interned for homosexuality are not freed, but required to serve out the full term of their sentences under Paragraph 175. Nazis and Allies were enemies, but they agreed that homosexuals should be locked up. The Allies liberated everyone else, but kept those who wore the pink triangle in prison! In Jesus’ time Romans and Jews were enemies, but they agreed that the man who loved without limits should die. 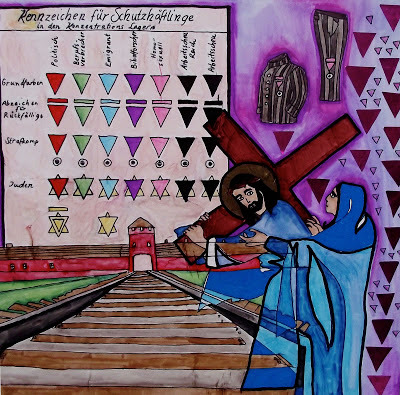 The Nazis used pink triangles to identify prisoners sent to concentration camps for homosexuality. It was part of a system of triangles labeling people they deemed “undesirable.” Originally intended as a badge of shame, the pink triangle has become a symbol of pride for the LGBT movement.